Are they designed with users mind? I have seen plenty of ‘fascist’ work spaces, these require you to work in a certain way that looks minimal and clean. They seem brilliant until people are involved, because we bring our life and work with us and disturb the immaculate space. I find they always seem to fall short of incorporating humans, and anything other than working solely from a laptop. It seems people aspire to the idea of ‘tidy desk, tidy mind’, but is that an achievable reality when your job requires multiple pieces of work paraphernalia? To be compressed and stripped back by a space is not helpful to the creative process, a lot of creatives / designers like to be surrounded by their work and ideas. A psychological study found that participants with messier desks came up with more creative ideas when faced with a problem and were better at thinking outside the box, than those with orderly desk spaces. No John, it’s official, I’m not cleaning my desk! So then being oppressed by the space and made to feel like you are intruding on it’s sense of tidiness is the perfect way to kill creativity. Some people can only think through paper. I know plenty of writers who work with pen and paper first, interior designers who draw instead of use CAD and CAD designers who sketch first. So, the question becomes, is a regimented workspace somewhere we can do our best work? Or is the idea of it, the hyper organisation, something that just manages to pull us back from the brink of creating a desk based apocalypse. In my opinion, working spaces always need a human touch, or at least space for a human touch. The idea of the modular or cubicle work space died a long time ago. Back in 2001 The International Facilities Management Association showed that 70% of all workspaces were already open plan. Many office spaces evolve around the open plan aesthetic but even this is being pulled apart as statistics from an Exeter University study emerge indicating workers are 15% less productive in open plan. 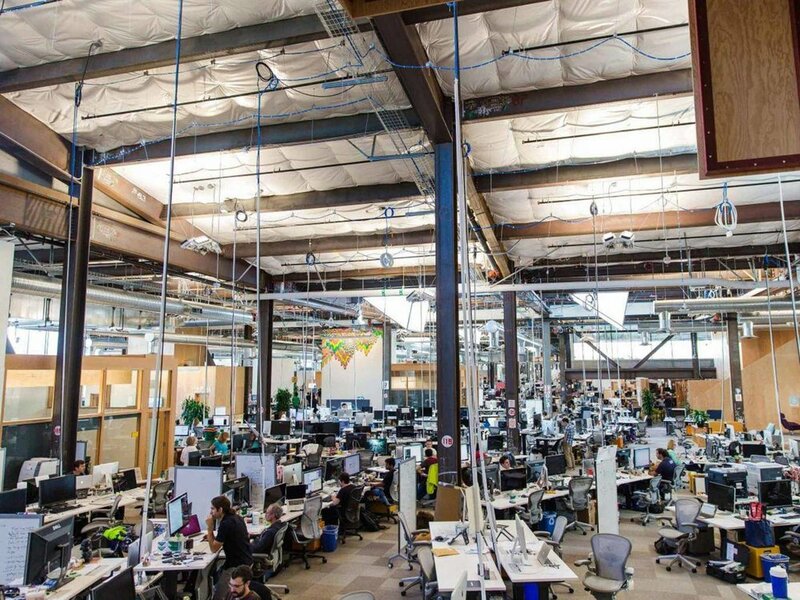 At its worst, open plan offices are like cavernous warehouses, both stifling and draining. The acoustics can be terrible and the feel or mood of the space can be exhausting. For example below is Facebook’s 430,000 sq foot headquarters in California it is my idea of a nightmare. Great open plan offices provide you with physical and mental space to work but if you make the space too big and too open plan, all the energy in the room dissipates and you end up with no working atmosphere and a lot of casual distraction, it is a fine balance. So when you want quiet, the feeling of privacy, or a space to focus without getting distracted you can shut out the world for your hermit eureka moment in isolation. See our last article ‘4 Examples of Great Open Plan workspaces’. We now spend 80% - 90% of our lives indoors making this arguably the single most important factor to consider in any room. Light is responsible for a large portion of your physical and mental well-being. In the 1980’s lack of sunlight was recognised as a health condition classified as SAD (seasonal affective disorder). So a naturally well lit workspace is more likely to be a healthy workspace. Lighting can set and change the mood of the space. Well lit spaces give people more energy, and it is even better if you can change the light settings for different times of the day. You need to always consider the availability of natural light in a space before adding artificial ones. This is very important, especially if you are working in the creative industry. Also it is widely functional, saving your electricity bill and your eyesight. Having a lighting plan for your space is a great first step for an interior designer or planner. High contrast of a computer screen will destroy your eyes in a matter of minutes, imagine what it will do to you over years. Light the whole room and your productivity will increase along with your health. Lighter spaces seem bigger and more spacious. Give people the feeling of space and you give them the space to think. Darker and artificially lit spaces can seem claustrophobic and in that feeling restrict your creative process. An excellent example of a well lit space can be seen above in Architectural Practice Selgas Cano in Madrid. Half buried with walls of curved glass, this office space is perfectly lit throughout the day. Submerged in nature the office combines natural light with stunning views of the trees to rest the eyes and inspire it’s staff. Stress accounts for 40% of all workplace ill health. Plants are an absolute necessity in the office. If you have one on your desk already, get two, if you have two get three. They can completely change the mood in the room. Adding plants to a previously minimal office could increase productivity up to 15%. According to NASA they oxygenate the room and remove toxins such as benzene, formaldehyde and trichloroethylene helping to purify the air in offices. I love plants in the office because they create a relaxing space around my desk that can help kill anxiety and absorb noise by reducing distracting background sounds. They provide that all important natural visual stimulation without being intrusive, and can give me a respite from the harsh screen light. If like me, most of your work is computer based, it is nice to have something natural to look at to remind you the post apocalyptic future has not yet come. They also give you a moment to relax the eyes and recharge without just staring into a white wall void. If you’re looking for a place to buy plants for your office try www.spiderplantshop.co.uk in Brighton, they sell a fantastic range of different plants at all sizes and prices. If you can’t afford big plants, you can buy smaller ones and wait, spoiler... they grow. An interesting and appropriate example of this is from Baker’s new office in Denver, Colorado. They are a tech. company working in the cannabis industry. Their office is well stocked with plants (not that kind) in all the spaces including the working areas and the communal rooms. This helps keep their team relaxed and productive throughout the day. Work is not what you do, it is always the people you do it with. We all want a great working atmosphere and a fun place to work, whether that is co working or in a dedicated office. By fostering a great community and providing appropriate spaces for collaboration, social time and communal eating you can radically change the atmosphere of your company. This will also create a spirit of positivity and improve communication between your employees or users in the space. Productivity improves by 20-25% in organisations with connected employees. The Skiff, a co working space in Brighton takes this one step further, the front page of their website says ‘ A community first and a workspace second.’ With organised social gatherings for their members, dedicated communal spaces and a communal kitchen collaboration could not be easier. It’s easy to see how they live up to their ideals and foster a great creative atmosphere and community. An inspired person is an engaged one and companies with engaged employees outperform those without by 202%. Inspiration and an inspiring working environment are crucial for the creative process and beating any creative block. Even if you are co working you can feel part of a team, or a community. You want your employees (or users if you’re a co working space) to want to go to work and believe in the what they are doing. If you provide an inspirational place to work you will engage your community and the quality of their work will improve exponentially instead of creating a 9-5 grind mentality. You can see this in bundles when looking at Bombas’ new office space. With spaces to put up work and a workspace coated in their brands colours it would be hard not to be inspired by the company space. 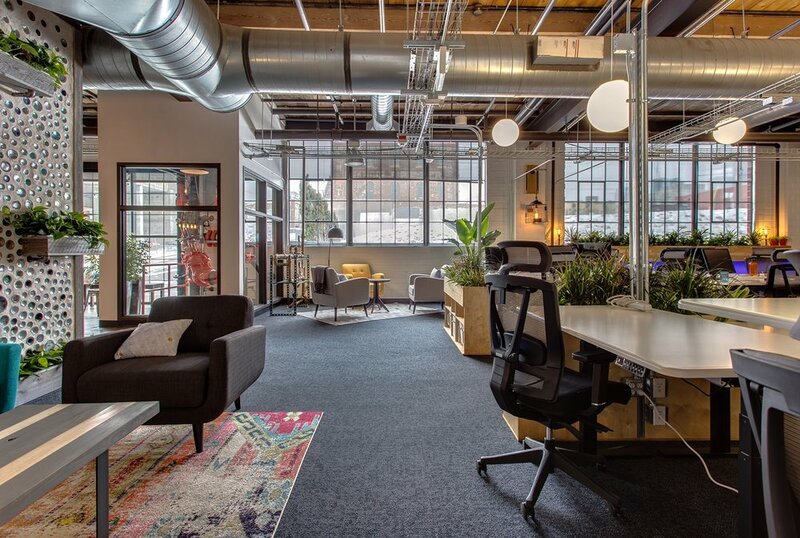 The layout includes great light fittings, wire frames to hang plants and other well chosen furniture enticing you into the space and drawing out your creativity and giving you the space to do your best work. Many ‘white space’ work spaces are co working in open plan or hot desk offices. I think in this envoronment, the idea of the white, empty space is symbolically important, it is an invitation. Somewhere you can implant yourself, and bend the space to your own way of working. Minimalist spaces can be crucial to creativity in that they are clean slates that can be moulded to suit the moment and wiped clean again. The best ones are those that combine the elements from above and provide enough opportunity to personalise the space if only for a day. Thanks for reading, If you found this post useful check out some of our others below or browse our resources page for helpful tools.